When the great wave of late nineteenth and early twentieth-century immigration from Italy began, Americans had already gotten the word that the new arrivals, and especially those from Italy's south, were undesirable. European pseudoscience defined them as racial and cultural inferiors predisposed to crime, political extremism, and social backwardness. European newspaper articles about organized crime in Sicily and Campania alarmed a predominantly Anglo-Saxon United States, and nativists seized on them to denounce the new immigrants as a threat to America. A 1903 editorial cartoon titled "The Unrestricted Dumping Ground" depicted southern Italian immigrants as dark-skinned, half-human, half-rodent creatures labeled "Mafia," "anarchist," and "socialist." But if the American press used its power to defame Italian immigrants, the newspapers startedby Italian immigrants defended their co-nationals by distancing Italians from other ethnic and racial minorities: Asians, Native Americans, and above all, African Americans. The Italian immigrant press insisted that contrary to nativist claims, Italians not only indeed were white; as heirs to a glorious European civilization, they would "save" America from the perils of race mixing. In his new book, A Great Conspiracy against Our Race: Italian Immigrant Newspapers and the Construction of Whiteness in the Early 20th Century, Peter G. Vellon chronicles how the Italian American press treated race and ethnicity, from the peak years of immigration in the late nineteenth century to the early 1920s, when U.S. authorities began to impose restrictions on southern (and eastern) European immigration. Vellon, who teaches history at Queens College, shows how "prominenti" newspapers –those owned by politically conservative businessmen and self-proclaimed community leaders – shaped and reflected ideas about race and ethnicity among Italians in America. 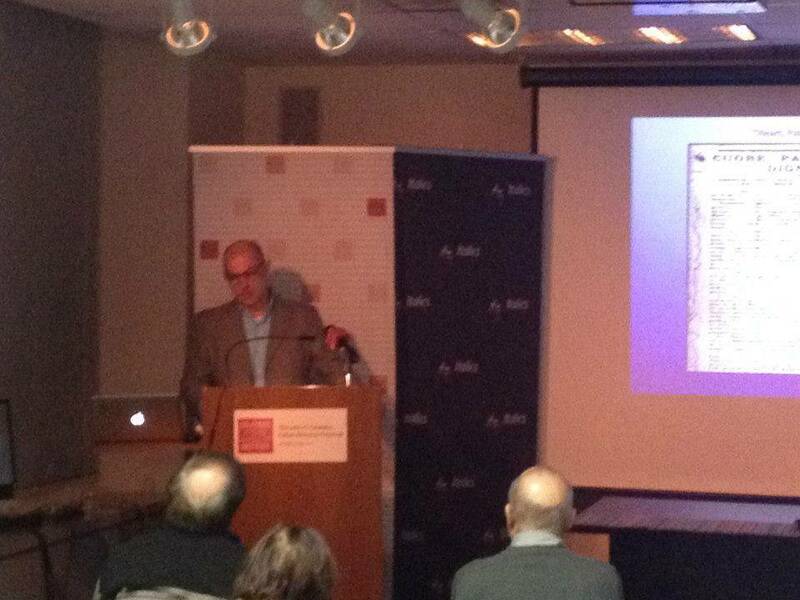 During a presentation earlier this month at the Calandra Italian American Institute in Manhattan, Vellon focused on several of the many immigrant papers (at one time, there was one newspaper for every 3.3 Italian New Yorkers). One of them, the weekly Il Cittadino, deplored racist attitudes against Italians, claiming that the newcomers, rather than diluting the white race, would save it. Without the immigrant influx, the paper warned, African Americans, then 10 percent of the US population, might reach dangerously high levels. Italians, the paper claimed, would keep the United States from becoming a nation of mixed blood. Il Cittadino and other newspapers developed and disseminated an identity steeped in class-based and racial conceptions of italianità, Vellon said. The notion of Italian-ness was foreign to the immigrants from the south, who thought of themselves as Sicilian, Calabrian, or Neapolitan, rather than as Italian. The immigrants landed in America at a time when the recently unified Italian state was engaged in what Vellon called "a top-down construction of what it is to be Italian, a mythic identity constructed on the notion of being a civilized race that produced the Renaissance and Columbus." The Italian immigrant newspapers, Vellon said, embraced this newly constructed identity and sold it to their readers. 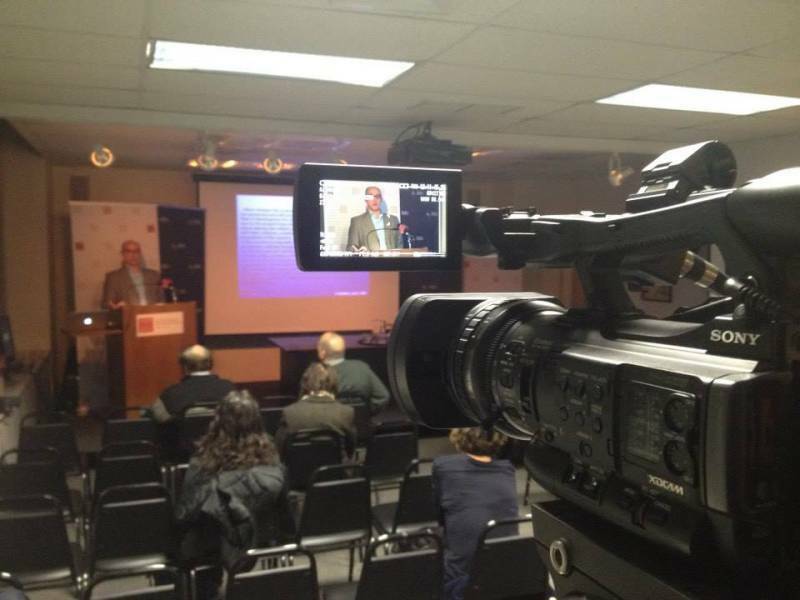 The papers "were working through notions of how immigrants should act and behave while at same time defending Italian Americans from nativist attacks," which, Vellon noted, were not limited to defamation in the press. Lynch mobs were murdering Italian immigrants, mainly in the South, but also in the Midwest and Northeast. Early on, Vellon noted, the immigrant press had demonstrated some sympathy for the plight of African Americans, with editorialists expressing horror over lynching and other instances of racial oppression. World War I changed that. The war brought "hyper-nationalism and Americanization campaigns"; at the same time, the African American mass migration from the south to northern US cities was underway. The prominenti newspapers, Vellon said, responded to these conditions by forcefully asserting that Italians, "by dint of their race and Italian-ness," were "part of the solution of keeping America American." How effective were the papers in inculcating racial ideology? 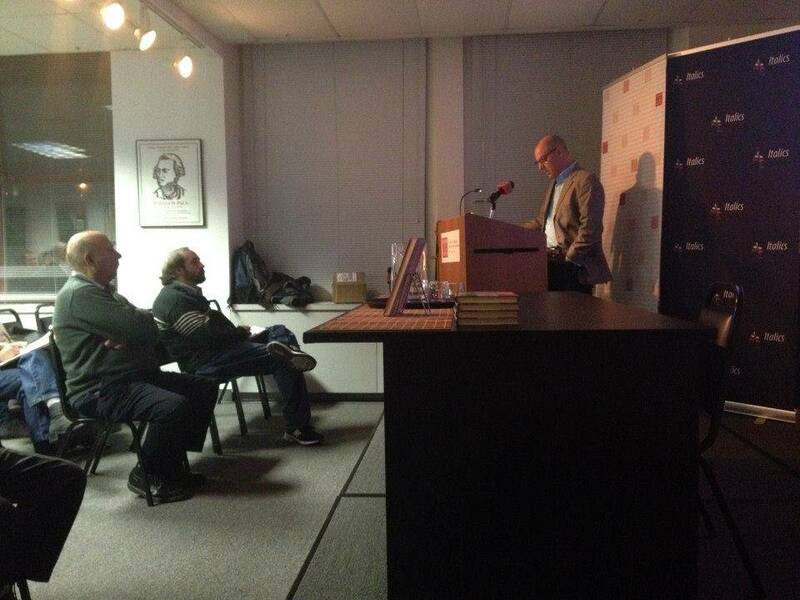 Vellon remarked that although the press "provided a master narrative" of Italian and Italian American identity, the immigrants also "were learning at the workplace what blackness and whiteness meant, how labor unions organized Europeans but not African Americans, and who lived in which areas and who didn't." The papers, by endorsing Italian colonialism in Africa as a civilizing mission, espoused the same racial ideology as the emerging Fascist movement, Vellon observed. They sowed the seeds of Fascism among Italian Americans; Generoso Pope, the publisher of the largest-circulation paper, Il Progresso, became Mussolini's "mouthpiece" in the United States. 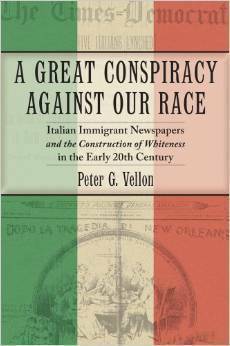 With A Great Conspiracy against Our Race, Peter Vellon has made an important contribution to the history of immigration and race in America, by showing how Italian immigrant newspapers promoted an us-against-them ideology to defend Italians and gain their acceptance by a hostile nation. The consequences have haunted Italian American and African American relations ever since.